The battle began when Project.Mayhem. assembled a 65 pilot Machariel Battleship fleet with the intent of reinforcing a Circle-Of-Two [CO2] tower in the Hakonen system. Dreadnoughts were put on standby as the force made its way to the system. En route the Project.Mayhem. Fleet Commander received intelligence that the Imperium forces were expecting his fleets. Regardless, once the fleet entered Hakonen, it warped to the station, picking up 3 Triage Archon Carriers before warping to the tower at close range. There, a Circle-Of-Two Machariel fleet waited under the tower’s shields. The Circle-Of-Two fleet was of similar size to the Project.Mayhem. fleet. With Project.Mayhem. setting up on the tower and starting to reinforce it, the Circle-Of-Two fleet quickly pinged on the grid before warping within close range of the Project.Mayhem. fleet, starting the actual fight. The two fleets had a quick fire exchange, auto-cannons ripping hulls when Project.Mayhem. decided to escalate first, dropping 7 Dreadnoughts on top of the Circle-Of-Two Machariels. Circle-Of-Two responded in kind, bringing 8 Dreadnoughts and a Carrier to the field. The two Capital forces started engaging each other, the Circle-Of-Two Capitals aiming for the Project.Mayhem. Triage support while the Project.Mayhem. Capitals switched from the Circle-Of-Two Machariels to its Dreadnoughts. At the same time, another cynosural becaon was lit on grid and into the system bridged an Imperium Hurricane Battlecruiser fleet, estimated at 80 pilots. With the addition of the Hurricanes on the field, the Project.Mayhem. fleet started breaking. Hammered by the artillery barrages of the Hurricanes and the auto-cannon fire of the enemy Machariels whilst its Triage support was annihilated by the Circle-Of-Two Dreadnoughts, the Project.Mayhem. fleet could not hope to tank the incoming damage. In rapid succession Machariels were simply volleyed by the overwhelming firepower exhibited by the Imperium. Project.Mayhem. had one more ace up its sleeve and lit another cynosural beacon, ushering in fresh Dreadnoughts courtesy of Out of Sight. [OOS]. These Dreadnoughts, 8 in total, reinforced the Project.Mayhem. Capital fleet while the sub-Capitals retreated. As Project.Mayhem. sub-Capital ships conceded the field, the two Capital forces continued to fight on, the Imperium sub-Capitals adding their fire power and concentrating on the enemy Capitals while Circle-Of-Two’s Dreadnoughts went down one after the other. As the Capital exchange raged on, Northern Coalition. [NC] forces reached the system, having been contacted by Project.Mayhem.. Northern Coalition. had assembled a 120 pilot Proteus Strategic fleet and was en-route to the Ostingele system in order to engage Spectre Fleet. However hearing about the Imperium fleets in Hakonen, Northern Coalition. 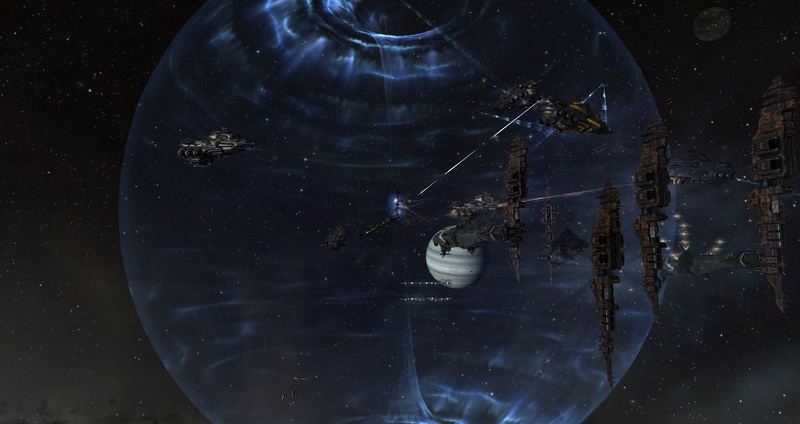 Fleet Commanders decided to divert their forces to the system. The force warped to the tower at a perch before warping to the Imperium fleets at a range of 40 kilometers, engaging them. Project.Mayhem. also used the time its fleet left grid to re-ship to a matching doctrine and warped back to the fight to aid Northern Coalition. forces. A quick exchange occurred with Imperium forces being overwhelmed by the combined Proteus fleet, losing Machariels and Hurricanes at an alarming rate. Imperium forces decided to disengage, managing to destroy one last Dreadnought before entering the tower’s shields. With the field won, Northern Coalition. forces continued to their original destination of Ostingele while Project.Mayhem. and Out of Sight. extracted the remaining Dreadnoughts and their fleet, deciding not to reinforce the tower. This allowed Imperium forces to return unimpeded to their staging systems, ending hostilities in the system for the night. All told the battle lasted 30 minutes and saw an estimated 350 pilots at the height of the fighting with Time Dilation not reported as a major issue by the combatants. Project.Mayhem. and its allies lost 29 ships including 5 Dreadnoughts, 3 Carriers and 12 Battleships for a total of 46.02 Bil ISK damage. Imperium forces lost 46 ships including 8 Dreadnoughts, 20 Battleships and 8 Battlecruisers for 38.09 Bil ISK damage. Northern Coalition. lost only 2 ships for a total of 507 Mil ISK damage. And next time CFC will bring 250 ppl to a 100 ppl fight in order to compensate for the batphone and you can complain some more about how they blob all the time and don’t do good fights…. Yea because you only had 176 to 76 to begin with. So ironic that anytime they fight more than a sole alliance they yell batphone, project m batphone nc, nc batphoned pl, moa batphoned oos, yet everything they forum a fleet they have what 8 alliance in the fleet. If you like to fight with only projectM, the only bring a fleet from one of the cfc alliances. CFC fought 177 vs 76. Only when mayhem batphoned ncdot for another 100, was the numbers even. That’s not blobbing, it’s an even numbered fight – stop your whining and appreciate the gf when you get one. Now it has to be a fair fight? The tears of the tough sure are funny. …get a grip, this is whining.